Twenty-nine million people can't be wrong. That's Volkswagen's answer to my innocent enquiry about why the seventh-generation Golf looks hardly any different from its predecessors. To be sure, the VW Golf is one of the icons of the motoring world. You meddle with icons at your peril. Volkswagen's designers, led by the celebrated Walter de Silva, admit that the challenge was 'to repeat the Golf without repeating the Golf'. The reason for the new Golf to be launched now, when the sixth-generation lasted only four years, has less to do with a change of appearance than what lies beneath its comfortably familiar body. Volkswagen has a revolutionary new plan to build all of its cars, and those of the other companies within the Group, using modular 'toolkits', structures and sets of components that can be mixed and matched for a wide selection of model types and sizes. As VW's highest-volume model and the epicentre of the Group's huge range of products, it was important for the Golf to be among the first cars to use the MQB toolkit. MQB stands for Modularer Querbaukasten, which translates from the German as 'modular transverse matrix'. It will eventually extend to all front- and four-wheel drive models from the Polo to the Skoda Superb. It is a big deal because it will account for more than 4 million cars a year. Standardizing more basic components, engine and suspension mounting points, and safety structures reduces vehicle weight, with cost and fuel consumption advantages, and results in cost savings  which VW will use to improve its competitive position. The new Golf builds on the MQB with its own elements. The share of high-strength steels has grown to 80 per cent, compared with 60 per cent in Golf VI and the 400 parts that make up the Golf body include special tailored blanks, where the material is in different thickness for different purposes, and ultra-high strength hot-formed steel components. As a result, some versions of the new Golf are 100 kg  about 10 per cent - lighter than old, comparing similar specifications. This, together with new and revised engines, has reduced fuel consumption and emissions by up to 23 per cent. 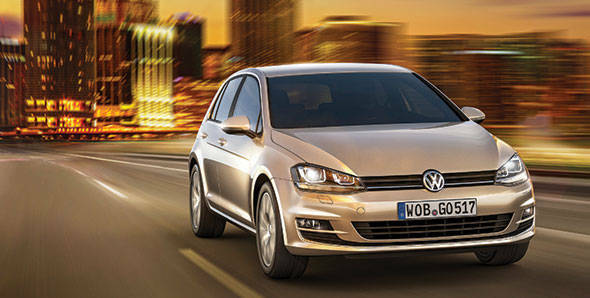 Volkswagen claims that the new Golf is the technology leader in its class and one of the most advanced cars in the world. Certainly, it continues the trend for compact cars to offer the latest electronic features more usually associated with expensive premium models. Volkswagen calls this the 'democratization of technology'. It includes, as standard, a multi-collision brake system, which works with the airbag sensors to automatically apply the brakes during and immediately after an accident to avoid a second impact after an initial collision, and radar adaptive cruise control with city emergency braking which automatically applies the brakes from low speed if a frontal collision is imminent. At 4.25m, the new Golf is 56mm longer than its predecessor, 28 mm lower and 13mm wider. Because the extra length is taken in the wheelbase, cabin space is increased, notably in the rear seat area. The interior is more radically different from the exterior; still neat but with higher quality trim and improved ergonomics. The central audio and navigation touch-screen  which comes in three sizes  has infra-red proximity sensors which turn the display into operating mode as a finger approaches and allow wipe-scrolling like an iPhone. The top version of the radio-navigation system also provides an internet hotspot. It is the sheer quality of the cabin that impresses when you first drive the car. And the quietness  engine, road, and wind noise are all remarkably low. It is no exaggeration to say that this is a compact hatchback with the refinement of a Mercedes E-class or BMW 5-series. The optimum version, at least until the new Golf GTI is available, is the 1.4 litre TSi, with a new turbocharged petrol engine developing 140PS and the seven-speed DSG dual-clutch transmission. This new 1.4 is the first four-cylinder engine from Volkswagen  or anyone else  to have active cylinder management, a system which cuts out two cylinders when coasting or running at low load. It works imperceptibly in conjunction with a stop-start system and contributes to this model's impressive fuel consumption figure of 21.27kmpl. Its performance is good  0-100 km/h in 8.4 seconds, 210 kmph maximum  and easily accessible since the turbo engine develops maximum torque from 1,500rpm. The DSG gearbox (with dry clutches in this form) works well as an automatic but is more responsive to manual changes from the paddles behind the steering wheel. Volkswagen has improved on the electric power steering of the previous model and, with the 1,000 Euro option of the driving profile selector, the driver can adapt the car's ride and handling to his or her taste, switching between comfort, normal, sport and eco modes to adjust steering effort and damper settings, as well as throttle response and the speed of gear-shifting. A brief drive in a Golf diesel, with the familiar 2 litre TDI engine and a six-speed DSG gearbox, proved that it had comparable performance to the petrol 1.4 and was only a little noisier and less refined. Our test cars, experienced on quiet roads in the north of Denmark, were loaded with all the most sophisticated options but it is worth noting that the lowest-priced versions of the new Golf, with engines developing less than 120PS, have torsion beam rather than multi-link independent rear suspension. We can guess that this cheaper (but 15 kg lighter) system will be more prominent in MQB cars from some other brands in the Volkswagen Group. So far, we have seen MQB applied only to the Golf, Audi A3 and Seat Leon. We took the opportunity to drive the Golf back-to-back with the latest A3 and came to the conclusion that the upgraded VW was better in nearly all respects. The Volkswagen Group always claims that there is no cross-shopping between everyman VW and posh Audi. But VW has such a solid reputation in Europe that it can itself command a premium over other 'generalist' brands. Looks apart  the new shape is clean but bland - the way that the Golf has evolved in its seventh generation is so impressive that it should be enough to worry not only Audi but also BMW and Mercedes.